Is anyone else feeling groggy this morning? No, okay. Right well I just wanted to give a quick update on my Project Apollo. I’m not doing what I’ve done before and set myself daily, weekly and monthly word count targets. Neither am I just sitting at my computer typing away constantly after I finish my day job. Like last night I knocked out 500 words, give or take, and edited through a couple of big chunks of text which did not need any heavy work on. 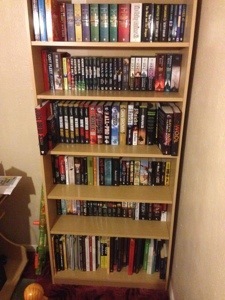 Then I tidied my book shelve and finally logged all of my books on it onto Goodreads. I’m doing this because although I love a word count, I’ve learnt that my head does not like trying to hit a target and after a while I impose a lot of pressure on myself and I run out of steam. This time though I like the pace I’m working at and I’m still leaving time for other bits that I want to do in my evenings. One thing that I am trying to do is to do a little bit each day. Once in a while myself and my dear friend Cinta Garcia de la Rosa (http://cintascorner.com/) talk about this because she said to me that to pick up a habit of something all one has to do is do that thing for 21 days so that’s the only target I’m aiming for at the moment. I’m not going to put too many details of word counts and progress of Project Apollo up here but I am making progress, me and Owen are keeping in contact more on this one then we have ever done before which is helping, both on the creativity but also on keeping me motivated.